With the exception of "Reflection" on the iPhone X, Apple hasn't updated their catalog of ringtones and alarms since iOS 7 dropped back in 2013. Since then, the company has come a long way with the quality of the iPhone's speakers, but their tones haven't adapted to meet those changes. That's left an opening for others to create their own ringtones mastered for the iPhone. You might not think about how iOS' ringtones and alarms take advantage of your iPhone's specialized speakers, but sound engineer Ilija Cvetkovski does. Cvetkovski, who goes by ILIJAC online, was disappointed with the way Apple's stock tones sounded on his iPhone X, so instead of complaining about it on the internet, Cvetkovski designed a suite of new ringtones and alarms to match the iPhone's speakers' specifications. What I did was I tested the frequency range of the iPhone X speakers and designed sounds with a specific EQ and limiter that will match the exact maximum and needed power. To elaborate a bit, with a pink noise I checked the frequencies on which the X is distorting and leveled them with EQ, while boosting the other ones where the loudness is safer and can play louder frequencies. In short, the engineer tailored the sounds to play as loud as possible while still sounding great on the iPhone X. The result is a collection of some of the best-sounding tones available for your iPhone. Each tone sounds striking, getting as close to surround sound as you could ever expect from a smartphone speaker. From twirling to whizzing to sweeping and beeping, you need to hear these tracks to understand why they're so good. If you don't have an iPhone X or iPhone 8 Plus, don't worry — while the ringtones and alarms were designed with those models in mind and approved by Cvetkovski for both devices, other users found that the tones sound great on other older iPhone models as well. Cvetkovski has posted all 30 of the ringtones and six of the alarms on his website for free. While you can donate if you wish, there's no requirement to do so (though I'm sure it will incentivize him to make more sound bundles). Just scroll down to the bottom of the page, and tap either "Ringtones" or "Alarms." Tap the play button on one of the two ringtones collections or the alarms collection to listen to a small preview of each file. Unfortunately, iOS doesn't make it easy to download and install ringtones from non-Apple sources. In order to move these custom sounds to your iPhone, you'll need access to a computer with iTunes. 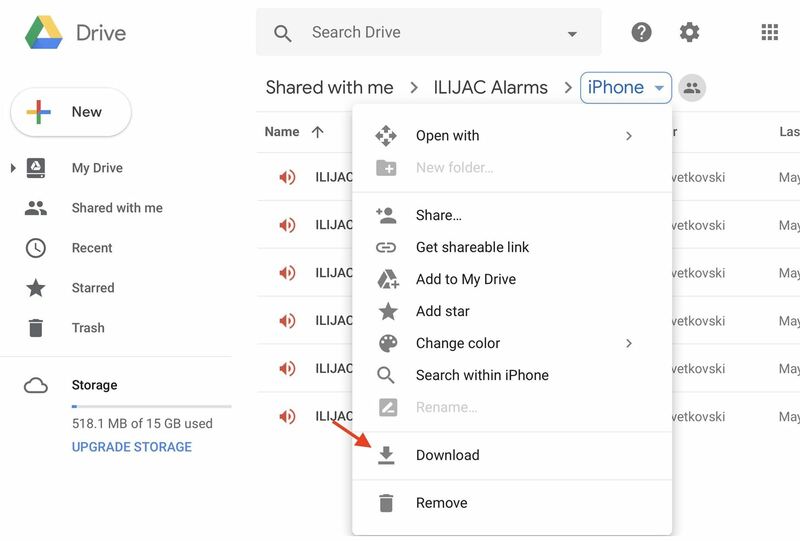 From the browser on your computer, visit Ilijac's website linked above, then click the "Download" link underneath one or both of the two ringtones collections or the alarm collection. Next, sign into your Google account to access the files on Google Drive (if not already signed in). 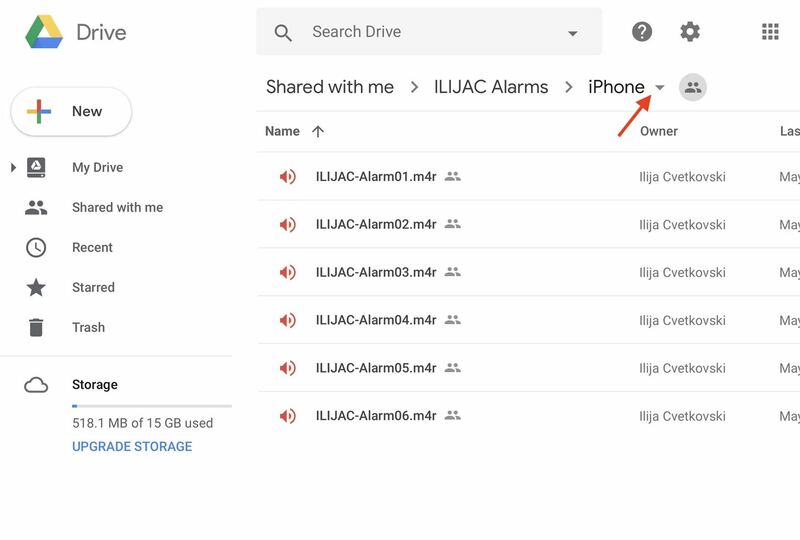 Once you've chosen between Bundle 0 or 1 of ringtones or the alarms bundle, the .m4r files, which are is the format that Apple uses for ringtones and other sounds, are located in each bundle's "iPhone" folder, not the "MP3" folder. You can simply right-click on the "iPhone" folder, then select "Download," or you can open the folder up first in drive to see its contents, then tap the arrow next to "iPhone" to download all of the tracks. Alternatively, inside the "iPhone" folder, you can right-click on each item, and select "Download" to download tracks individually. Once you have all the files you want to use downloaded, you'll need to add the tones to iTunes and sync them with your iPhone. However, there are a couple hurdles to look out for along the way, and the process is different depending on if you're running iTunes 12.7 or higher or 12.6 and lower. For all the steps, be sure to check out our full tutorial on adding custom ringtones. Once you do, try out one of Cvetkovski's custom alarms. Maybe you won't wake up so grumpy anymore, since they fade in to gently wake you up. First of all, let me express my sincere gratitude, this was so satisfying to read! Thank you Mr. Jake for the support! Very much appreciated!